Samael in the History of Mankind. 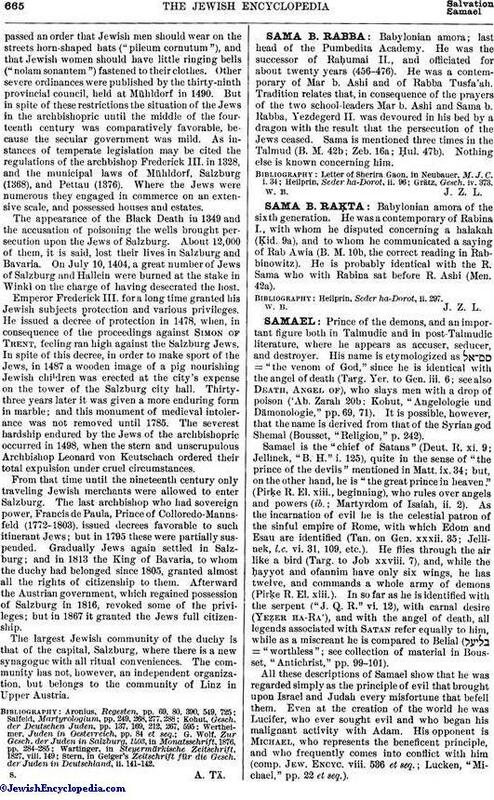 Prince of the demons, and an important figure both in Talmudic and in post-Talmudic literature, where he appears as accuser, seducer, and destroyer. His name is etymologized as = "the venom of God," since he is identical with the angel of death (Targ. Yer. to Gen. iii. 6; see also Death, Angel of), who slays men with a drop of poison ('Ab. Zarah 20b; Kohut, "Angelologie und Dämonologie," pp. 69, 71). It is possible, however, that the name is derived from that of the Syrian god Shemal (Bousset, "Religion," p. 242). Samael is the "chief of Satans" (Deut. R. xi. 9; Jellinek, "B. H." i. 125), quite in the sense of "the prince of the devils" mentioned in Matt. ix. 34; but, on the other hand, he is "the great prince in heaven." (Pirḳe R. El. xiii., beginning), who rules over angels and powers (ib. ; Martyrdom of Isaiah, ii. 2). As the incarnation of evil he is the celestial patron of the sinful empire of Rome, with which Edom and Esau are identified (Tan. on Gen. xxxii. 35; Jellinek, l.c. vi. 31, 109, etc.). He flies through the air like a bird (Targ. to Job xxviii. 7), and, while the ḥayyot and ofannim have only six wings, he has twelve, and commands a whole army of demons (Pirḳe R. El. xiii.). In so far as he is identified with the serpent ("J. Q. R." vi. 12), with carnal desire (Yeẓer ha-Ra'), and with the angel of death, all legends associated with Satan refer equally to him, while as a miscreant he is compared to Belial ( = "worthless"; see collection of material in Bousset, "Antichrist," pp. 99-101). All these descriptions of Samael show that he was regarded simply as the principle of evil that brought upon Israel and Judah every misfortune that befell them. Even at the creation of the world he was Lucifer, who ever sought evil and who began his malignant activity with Adam. His opponent is Michael, who represents the beneficent principle, and who frequently comes into conflict with him (comp. Jew. Encyc. viii. 536 et seq. ; Lucken, "Michael," pp. 22 et seq.). The evil nature of Samael may be illustrated by a number of examples. He and his demonic host descended from heaven to seduce the first human pair (Pirḳe R. El. xiii., beginning; Yalḳ. Gen. i. 25), and for this purpose he planted the vine, the forbidden tree of paradise (Greek Apocalypse of Baruch, iv.). He was himself the serpent, whose form he merely assumed (ib. ix. ; "J. Q. R." vi. 328), and was one of the leaders of the angels who married the daughters of men (Gen. vi. 1-4), thus being partially responsible for the fall of the angels (Enoch vi., in Kautzsch, "Apokryphen," ii. 238 et seq. ; Lucken, l.c. p. 29). His former wife was Lilith (Jellinek, l.c. vi. 109). He endeavored to persuade Abraham not to offer up Isaac, and, failing in his purpose, he caused the death of Sarah by carrying the news of the sacrifice to her (Gen. R. lvi. 4; Sanh. 89a et passim; Pirḳe R. El. xxxii.). He wrestled with Jacob (Gen. R. lxxvii. and parallels), and also took part in the affair of Tamar (Soṭah 10b). He brought accusations against the Israelites when God was about to lead them out of Egypt (Ex. R. xxi. 7; Bacher, "Ag. Pal. Amor." i. 25, 473), and was jubilant at the death of Moses because the latter had brought the Torah (Deut. R. xi. 9; Jellinek, l.c. i. 12 et passim). Entering into King Manasseh, Samael caused the martyrdom of the prophet Isaiah (Martyrdom of Isaiah, i., in Kautzsch, l.c. ii. 124); and he considered himself victorious over Michael when God decided that the ten pious scholars during the reign of Hadrian must suffer death (Jellinek, l.c. ii. 66, iii. 87, vi. 31). On the Day of Atonement, however, Israel has no fear of him (Lev. R. xxi. 4). In the quotations from the Slavonic Book of Enoch (vi.) Samael is represented as a prince of the demons and a magician. He is, therefore, frequently mentioned in the cabalistic writings of the Middle Ages, from which Eisenmenger compiled a rich collection of passages ("Entdecktes Judenthum," i. 826 et seq. ), to which must be added those in Schwab's "Vocabulaire de l'Angélologie" (p. 199). As lord of the demons, Samael is regarded as a magic being, and must be considered in the preparation of amulets, although there is no agreement as to his power and activity. He presides over the second "teḳufah" (solstice) and the west wind of the fourth teḳufah, as well as the third day of the week ("Sefer Raziel," 6a, 40b, 41b; see also Schwab, l.c.). In Hebrew amulets Samael is represented as the angel of death ("Revue de Numismatique," 1892, pp. 246, 251). Eve is supposed to have become pregnant by him (Targ. Yer. to Gen. iv. 1); and the cabalists add many details to this legend (Eisenmenger, l.c. i. 832 et seq.). 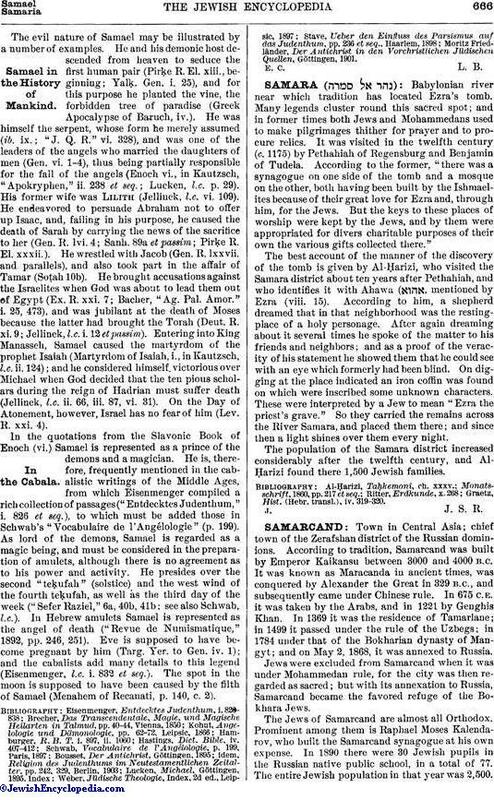 The spot in the moon is supposed to have been caused by the filth of Samael (Menahem of Recanati, p. 140, c. 2). Moritz Friedländer, Der Antichrist in den Vorchristlichen Jüdischen Quellen, Göttingen, 1901.